Numerous types business and personal locking safe exist on the market. These have varying degrees of security. 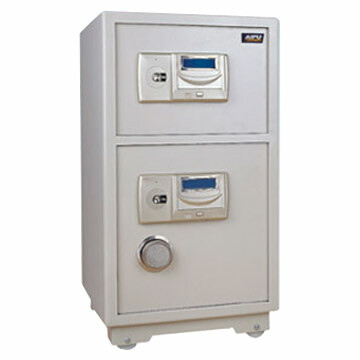 Floor or Wall Safes which are designed for home protection from theft of documents and valuables. Interestingly, these safes are rated according to the time necessary to cut a 6 inch hole in the door of the safe. Some consumers also use these for storage of important documents or currency. However as the name implies, a “cash rated” locking safe is recommended to use for storing large amounts of currency. In the case of safes needed for storing cash register business tills, it is recommended that the safe have a time rating. This is so that the attempted thief may give up while waiting for the door to reopen. Fire Safes are Underwriter’s Laboratory rated according to the amount of time the interior of the safe stays at 350 degrees during a fire. These fires are rated at an external temperature of 1700 degrees or more. This is an important factor to protect against when valuable documents are at stake, especially those that would be hard to replace without other identification. Due to both identity theft and terrorism, it is quite important to have identity documents in a fire-proof location. A fire safe lock will prevent access to the valuables and protect them from heat damage. Laptop Safes are usually also theft or fireproof locking safes and often employ an electronic safe lock. They are designed to hold laptops to both prevent identity and information theft, as well as simple theft. A locking safe for laptops is normally data and media rated for fire protection. This rating is the time period they will protect computer data, either on laptop, disk or CD, from excessive heat in the event of a fire. With the advent of identity theft, and many people storing bank and credit card accounts on their computers, and passwords, it is very important to have a good theft and fire protection safe. This is not only for a laptop, but other computer data media. Gun Safes are designed to keep your guns, and other valuables, safe and away from children, careless adults, or intruders. Due to the size of muzzleloaders, guns, and accessories, these safes are normally thin and tall. However, many families use firearm safes to store much more than firearms.